The speakers hammered out The Chieftains’ O’Sullivan’s March. “What the hell is this?” he demanded. I switched off the engine. He didn’t know what I meant by that comment. He thought he did, but not really. He would someday though; I was sure of it. He was a smart lad. It was already hot. The air smelled of baking pitch. My legs felt rubbery under the sun’s pressure, but the feeling didn’t last. By that time of year, the body had become acclimated. Marching up the paved trail, weaving through the lumbering tourists, my circulation rallied and my stride steadied. I passed pedestrians, some on the trail, some on the rocks beside the trail. It wasn’t that we were short of time; it was just nervous energy that made me walk fast. I slowed down when we turned off the asphalt and started up the narrow climbers’ trail. When we hit the relative cool of the Tower’s shadow, I began to stroll. Where the trail butted against the rock’s base, I stopped. 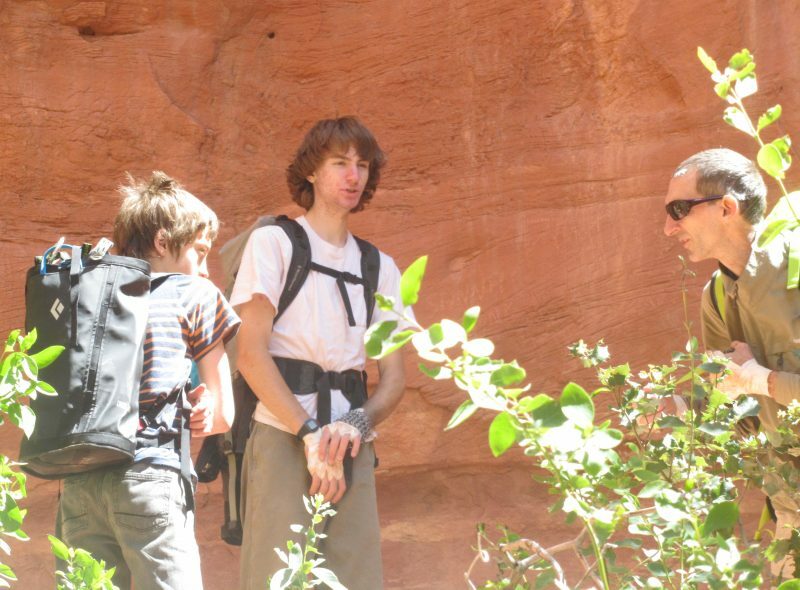 We dropped our packs and broke out harnesses and helmets while the sweat dried from our necks. He was ready quickly. He stood there looking at me, wearing a well-measured expression of annoyance. I wouldn’t do this with someone else’s child. We had a bond, from the beginning, that made it alright. When the neonatologist told us that he had been put on a ventilator, his mother started to cry. I held her hand and told her not to worry. She had been part of the pregnancy, and reasonably expected that she had been delivered from its troubles. I had watched it the whole time from the outside, without any expectation of relief. We both knew what could happen. We had seen fetuses get tangled in their development and come out confused. We had seen maternal physiology give up on the process and, against the mother’s wishes, abandon it all in various ways. She knew these things could happen to her. I knew what I would have to watch. It was my proper place. I was a climber and I knew how to be helpless without suffering from helplessness. That was why I didn’t cry, not when he was intubated, and not when I sat by the plastic crib and watched him lay too still. He wore a blinder for the first few days, to protect his eyes from the ultraviolet lamp which did his liver’s job for him and cleared the toxic pigments from his blood. They took the little mask off the day after the last of his tubes came out. He looked up, then he looked straight at me. He stared for a long time. The nurses made a big fuss about him recognizing his father, but I knew it for what it was. He had a little patch of nerves on the side of his brain which were devoted to facial recognition. Those nerves made a baby stare at faces, and they were working for him. He stood looking bored and a little impatient as I fiddled with my helmet’s chin strap. I was serious about Burning Daylight. It was a place that a friend of mine took those who would lay their hands on Mateo Tipi – the Bears’ Lodge – with impunity. 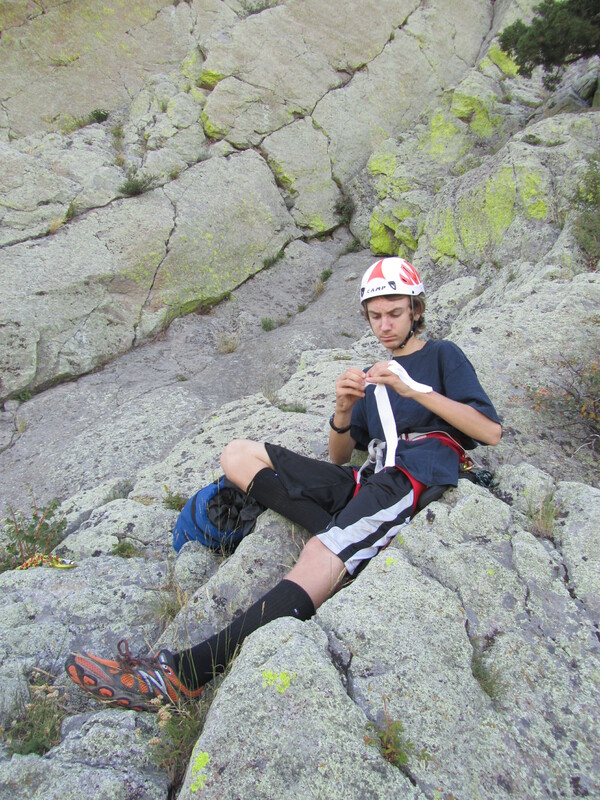 “I ought to be able to knit a sweater while climbing .10b,” the last one had said to him. When he demanded his sweater as she scrabbled over the last roof, wild-eyed and bloodied, she didn’t reply. We pushed through the bushes and clambered over a fallen log propped against the foot of the Tower. Where the scramble got steep, we roped up. The rope was mostly for my peace of mind. He could handle this terrain with little risk, even if it made him nervous. I didn’t have him put me on belay. If I fell , I would stop before my weight came onto him. The rope was for his mind more than his body too. It would speed him up and let him build some confidence along the way.I waltzed over the blocks and bushes, past the gnarled juniper tree and the briars to the ledge. This was the most dangerous part of the day; the routine, soft-focus section where a lapse could occur. I anchored into the base of the Burning Daylight crack and reeled in rope. He followed quickly, buoyed by the nylon cord. I hitched him into the anchor and began to sort gear. I would need everything, from aluminum wedges smaller than the end of my little finger, to cams as big as my fist. Part of the difficulty of the route was its variety. It never permitted a comfortable rhythm. I had him put me on belay and we went through our final check. He understood the seriousness of the process. He was a smart lad. But he didn’t understand all the reasons, not really.I started up. I placed a medium-sized chock in the first 10 feet. This was for him. If I fell, my weight would not come onto him directly. I would still break my leg if I fell, but he would be in good shape to get back down the approach. 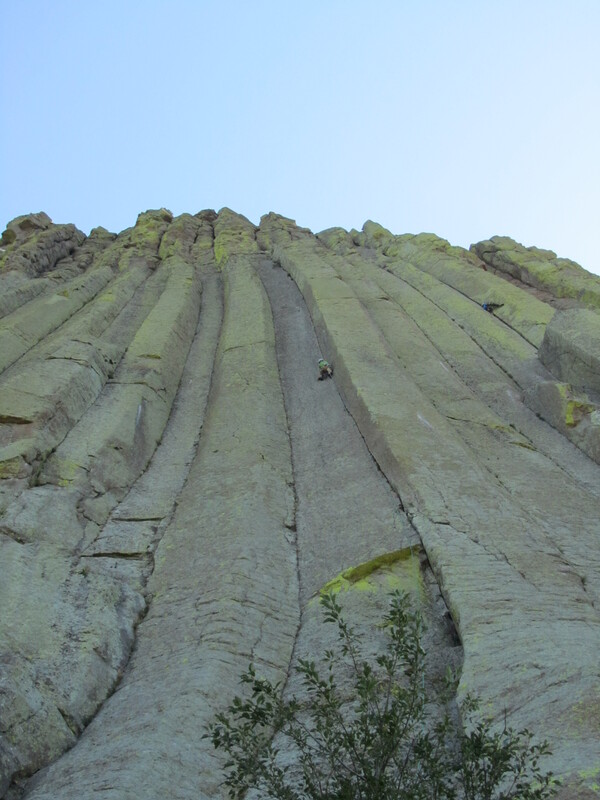 I moved out slightly onto the face to climb a series of edges, leading up to a stance below a bulging corner. If I fell from there, the gear failed and I hit the belay ledge, I would be killed. He would be on his own to get down, but I had confidence in his ability to do so. He had a natural faculty for seeing the mechanics of a situation clearly. It would work for him in case. I pulled through the bulge, feeling solid. Now standing under the crux roof, I dawdled with setting up the protection. I tried to remember how I had done it the last time, but I couldn’t. I trusted that the feel of it would come back to me as I began. That was the useful part anyway. Exposition of the moves just soothed the mind. I reached up and locked my fingers in the crack. My feet set on the last good holds, I stretched high with my other hand and set its digits in the fissure above the roof. They rested loosely. I tensioned my body against the handholds and moved my feet, the left one onto a small irregularity below the roof, the right to a vertical seam on the wall of the corner. My right knee turned in to hold tension, I shuffled my hands higher in the crack above the roof. The forces shifted back across my shoulders as I raised my left foot over the roof and set it on the smooth, sloping ledge. Without pressure on it, the sole slipped slightly. I recovered and reset it. Gently, I transferred weight onto the sticky rubber until it could withstand some force. One more step and I was over the roof. The next roof was easier, as it led to a hand crack. I wouldn’t fall out of a hand crack, not unless I had a seizure or was struck by lightning. It ended too soon. I placed a couple of cams near the top of the crack and began stemming up the final, overhanging corner. It was technical friction, not too hard, but with tired feet, it always felt desperate. I took my shoes off and secured the rope for him. He took a long time putting on his shoes. I couldn’t see him easily past the overhangs, but I was suspicious about the delay. “I won’t need it,” he assured me. There was another reason for leaving the bottom anchor: he would need it if he quit and had to be lowered. I began to take up rope as he advanced. It accumulated slowly on the ledge beside me. After 15 feet, I could hear him breathing. The respirations were even yet. Then the rope stopped. He must have come to the little bulge. A couple more feet of rope came up, then the line went taut. I bit down on words of encouragement. I wasn’t going to take this away from him just yet. Once more, the rope went slack, then taut, but there was no more swearing. He hung on the harness for a long time. When he moved again, the rope kept coming. No swearing at all this time. He stopped for a minute or two to puzzle out the crux. I leaned out from the anchors. I could see him now. He had the rattley finger lock over the roof. His right foot slipped, but he didn’t tense up or let go. He put his left knee against the edge of the roof and re-established the right foothold. He shuffled his hands up, and it went. He slouched in his harness and shook blood back into his forearms. Taking a deep breath, he stepped back onto the rock. At the second roof he paused and asked for a tip. He started the moves and got stymied. 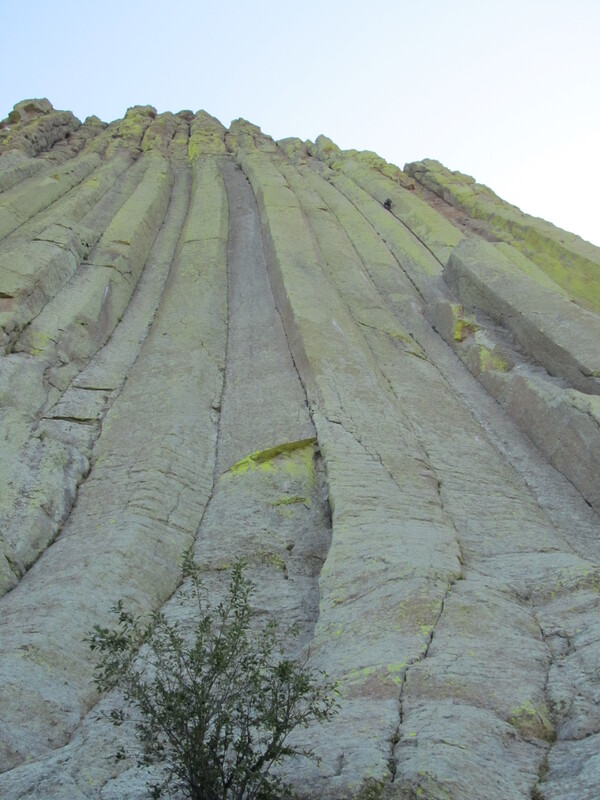 He cruised the rest of the crack to the friction climbing and the exit moves. The corner was steep again, and he was tired. For a minute, he tried to establish a position in the final, little chimney which would allow him to reach the exit holds. Exhausted, he weighted the rope again. At that point, I was close enough to reach down and give him a hand up if I just extended my connection to the anchor a little bit. The thought crossed my mind, but then he looked up at me. His expression reflected his fatigue and some exasperation, but no panic or defeat. He was comfortable on the rope, and he knew he could finish the climb. He wanted to finish. I sat back. “Take your time,” I told him. “Yeah. I’m back on,” he replied. With a little more fumbling and swearing, he managed to drape his hand over the solution-hold below the belay ledge and pull over the top. “Nice job,” I told him. “How hard is that compared to the hardest climb at the Tower?” he asked. “No, I mean how much harder is the hardest one?” he insisted. He nodded. I began setting up the rappel while he transferred gear to a sling on my shoulder. “Do you want to go first?” I asked. I checked his set-up and descended. At the base, I thought about resetting the anchor, but decided against it. He lingered for quite a while after I called “off rope”. I didn’t worry. I just sat and looked out at the perfect weather and the perfect flood-plain of the Belle Fourche river, not thinking about anything but the passage of time. And that, I told myself, was nothing at all.